As a senior iPhone user, you must be clear about that waiting for all operating systems' local support to HEIC images is still an enigma owing to there is a long way to go to make it come true. 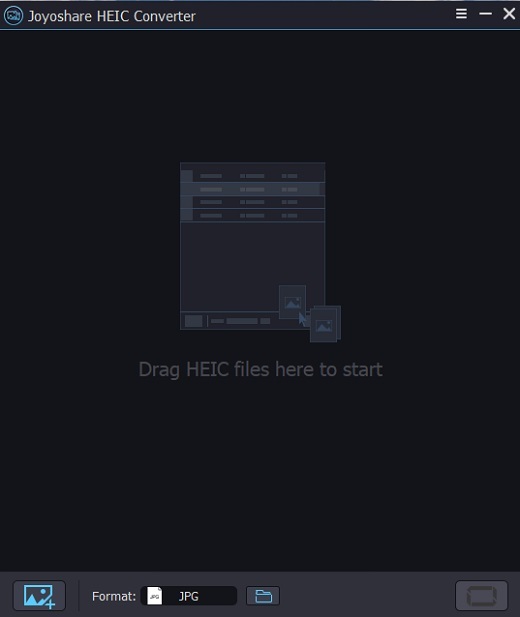 Up to now, no matter who have made great efforts to converting HEIC files to JPG has known some valuable tips or got some useful experience. How about you? Have you found a powerful and simple HEIC to JPG converting tool? If you have, what are the most attractive points to you? As far as I'm concerned, even though a special HEIC converter can support various output formats, if it can only realize single conversion at a time, it is not convenient enough. Supposed there are thousands of HEIC images to be converted, you are certainly willing to choose the most time-saving solution. Here we will provide 5 effective HEIC to JPG batch converters for your reference. As a professional image processing application, Joyoshare HEIC to JPG Converter is widely acceptable and enjoys a high reputation because of its comprehensive solutions. Its user interface couldn't be any easier with comfortable color and elegant layout. You can find it powerful as long as you have a try. With a few clicks, all HEIC images can be converted to JPG so that you can open and view them on any other devices. Of course, there are more other output formats available to support, for instance, PNG, GIF, BMP, TIFF and WEBP. 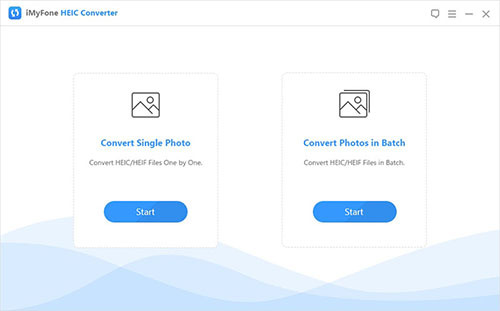 You don't have to remember the exact steps of how to operate this HEIC to JPG Batch Converter, which is simply enough to let you understand. Having synced and saved all iOS 11 HEIC images on your computer's local folders, you can easily choose it or directly drag any one you want to convert to the main interface. This HEIC to JPG software includes full support for converting HEIC files in batch and individually, bringing the best using experience for you with no harm to original image's quality at all. Moreover, it also enables you to customize output format, including quality adjustment, resolution setting, EXIF information preservation, all HEIC images support, etc. iMazing HEIC Converter is a small offline software, which allows you to convert iOS 11 photos to JPG with quality adjustment on the basis of your own requirement. In addition, PNG is also supported as an output format, which is popular used by more and more users. When you have downloaded and installed it, running it without worrying about the compatibility with your older software, you can add HEIC files or folders fast by dragging and dropping them. That is to say, you are able to convert multiple HEIC images in bulk. What’s more, iMazing HEIC Converter is well designed with support for color profiles, including wide-gamut. Just as some authorized HEIC to JPG Converters, it can help you to keep EXIF information of output images which can be set together with quality adjustment. If you are a new starter, you can use it unlimitedly considering it is totally free of charge with both Windows and Mac version. Not only an online platform but also an offline desktop app, Apowersoft Free HEIC Converter is capable of converting HEIC photos to JPG. For the online one, what you need to do is just open one of your browsers and then enter www. Apowersoft.com. Apowersoft Free HEIC Converter is developed with user-friendly main interface, whose central position is presented "Choose .HEIC/HEIF or Drop Them Here". You can import iOS 11 HEIC images by clicking the place where instruction shown or simply drag HEIC photos, which can be added up to 30 files at a time if you would like to convert in batch. It will cost only several seconds to finish conversion process. While for the desktop one, you have right to convert HEIC files with maximum quantity, 60 pieces of photos. What you should get to know is that the offline app with more supported file quantity will not be influenced on its conversion speed. 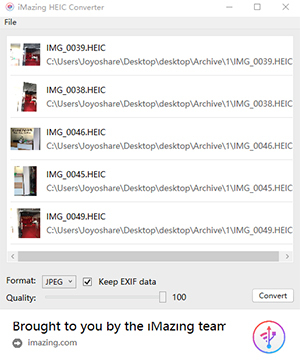 As a free PC application, iMyFone HEIC Converter provides a practical solution to you to convert all your HEIC photos JPGs with keeping original high quality. Of course, you are entitled to adjust the photos quality as well. There are two methods designed to realize conversion, which are convert HEIC file one each time or convert HEIC files in batch. Therefore, if you prefer to former one, you can choose" Convert Single Photo" by clicking "+" button to add a HEIC image or dragging and dropping files straightly, which at the same time can make you preview the photo. If you are fond of the latter one, you can accordingly choose "Convert Photos in Batch" by using the same way to import files. The most important thing is that you don't have to spend time transferring HEIC photos to PC first owing to it can convert HEIC photos in iOS 11. 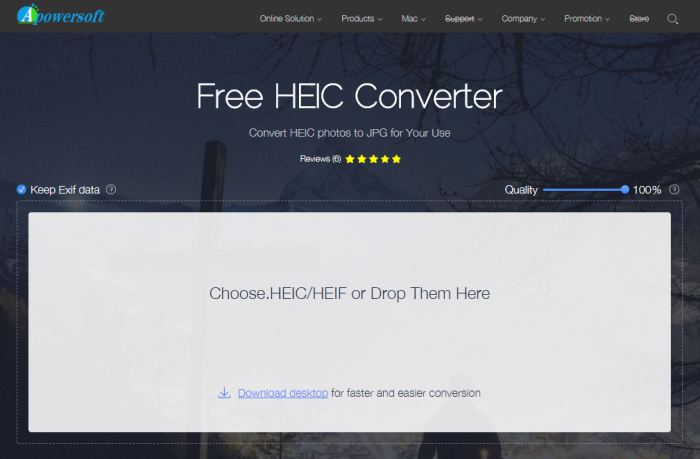 Different from other converters, HEIC to JPG.com is an online HEIC to JPG batch converter. Without downloading a desktop app, you can use it directly especially when you are in urgency. This online free converter is applied to convert HEIC photos to JPG so that all converted photos can open on Andriod phones, Windows operating systems and lower macOS systems due to its great compatibility. What is certain is that online converter is easy to use without any complicated interface. Better than similar online converters, it is listed as top priority owing to its batch conversion. More attractively, 50 pieces of HEIC photos is allowed to be imported at a time. However, do remember that you have to download converted images from cloud to your computer one by one. Meanwhile, I am not sure do you dislike the point that it cannot offer quality setting. Now, you must have a basic understanding about those top-rated HEIC to JPG batch converters. It is obviously that you will be familiar with them deeply once you have tried to operate. To a large degree, batch conversion is a personalized function that caters to most users. In my opinion, both Apowersoft HEIC Converter and HEIC to JPG.com are good choices for online users. However, if you favor to offline app with absolutely privacy protection, you’d better choose Joyoshare HEIC Converter, which is more professional and effective with all-in-one solutions. Of course, no matter which HEIC to JPG batch converter you prefer, you can get unique using experience. Do it right now!